ALL HOLIDAY WITH THE CRANES EVENTS ARE SOLD OUT! Mark your calendars – Next year’s dates are December 14 & 15. Note: Due to the weather forecast for early Saturday morning, we are cancelling our Saturday Dawn Patrol event that was to take place 6:30 a.m. All other events are still on including Sunday’s Dawn Patrol. 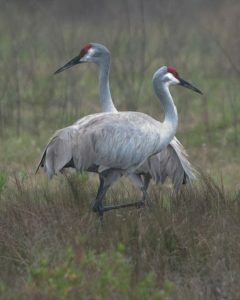 For a unique holiday experience, spend a wonderful, winter weekend in Galveston celebrating the return of the island’s wintering Sandhill Cranes at Holiday with the Cranes, Dec. 8 – 9, 2018. The weekend will be chock-full of indoor and outdoor nature activities combined with the ambience of historic Galveston Island! Holiday with the Cranes is presented by the Galveston Island Nature Tourism Council, a nonprofit volunteer organization that helps connect people with nature experiences and outdoor adventures, and promotes the value of natural habitats and resources in the Galveston Island area. Please see the 2018 Daily Itinerary below. GINTC members are eligible for a 10% discount. Dawn Patrol: Breathtaking Views of Sandhill Cranes in Flight at Sunrise (6:30 – 7:30 am) SOLD OUT! Coffee & Cranes with Special Guest Speaker Kristine Rivers of Birding for Fun!, Breakfast & Crane Crawl (8 – 11:30 am) NEW PRESENTER! SOLD OUT! East End Winter Coastal Birding: Exploring Diverse Habitats of the East End (1:30 – 4:30 pm) SOLD OUT! Chasing Birdies with Greg Whittaker (1:00 – 4:00 pm) NEW EVENT! SOLD OUT! Winter Birding on the Isle’s West End: Birding Hotspots Out West (9:00 am – noon) SOLD OUT! Current GINTC Members may enter MEM10 to enjoy a 10% discount on all events! If you would like to join GINTC, view our membership information at www.galvestonnaturetourism.org. Registrants should be at least 10 yrs old, and those under 18 must be accompanied by a parent or guardian. Registration is required of all attendees regardless of age. Saturday, Dec. 8 SOLD OUT! Tickets: $35, 10% discount to GINTC members. Every winter Galveston is graced by the presence of our elegant guests, the Sandhill Cranes. Standing nearly 4 feet tall, with striking plumage, they are hard to miss! You have probably seen them on the Island, but how much do you know about this fascinating species? We’ll take a closer look at the natural history and behavior of these graceful birds and celebrate their unique beauty. Coffee and a light breakfast will be served. After the program, if weather permits, participants will head out on Holiday with the Crane’s signature Crane Crawl. 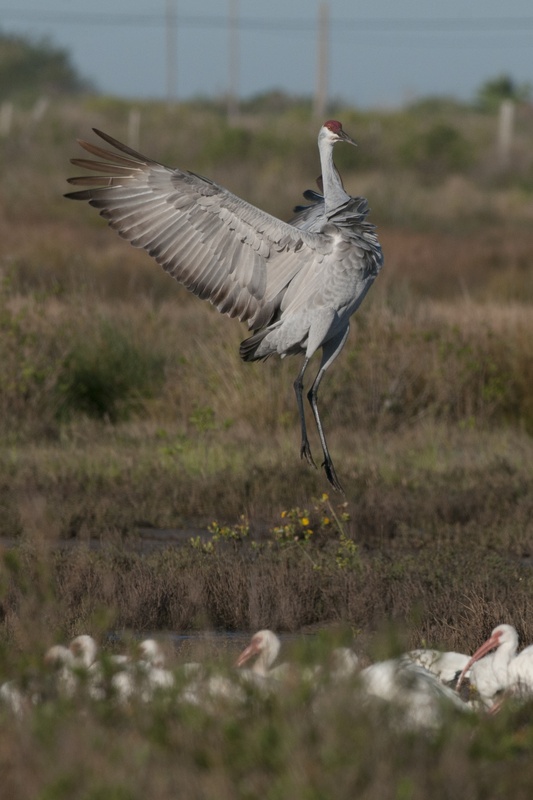 This self-driving tour to nearby crane hotspots will be a real-time opportunity to see Sandhills as they forage and play. You will be given a map and directions. Viewing areas will be outfitted with spotting scopes and volunteers will be on hand to assist and answer questions. Kristine Rivers grew up in Manvel, Texas and began birding at a very young age. By the time she was 14, she was serious enough about it that she participated in her first Christmas Bird Count with the National Audubon Society. She has continued to be an avid birder for her entire life. She has participated in every year of the Brazoria Christmas Bird Count (CBC) since its inception in 1984 and was instrumental in working with the founder and compiler to start it back up again in 2010 after a 16-year lapse. She has been an area leader for the Brazoria CBC since 2013. In addition, over the years she has participated in many other Christmas Bird Counts including the Houston CBC, Freeport CBC, Brazos Bend CBC and the Texas City Prairie Preserve Bird Count. She’s a FeatherFest field trip leader and leads field trips regularly through her business, Birding for Fun! Space is limited and this activity fills quickly. We are offering it on both Saturday and Sunday! Sunday, Dec. 9 SOLD OUT! 6:30 a.m. – 7:30 a.m.
Tickets: $30, 10% discount to GINTC members. It’s no wonder that our two Dawn Patrol events fill up so quickly – This early morning nature adventure is truly a magical and unforgettable experience. 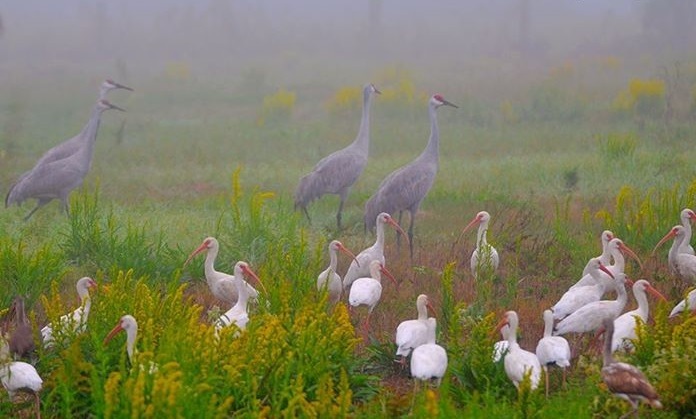 With special access to this private preserve, Dr. Alice Anne O’Donell will lead our small group within viewing distance of the 100 – 200 roosting Sandhill Cranes. You’ll also have the opportunity to see Roseate Spoonbill, ibis, herons, ducks, grebes, rails, sparrows, cormorants, hawks, Osprey, and sandpipers along with the majestic 3 ½ to 4 foot tall Sandhill Cranes! 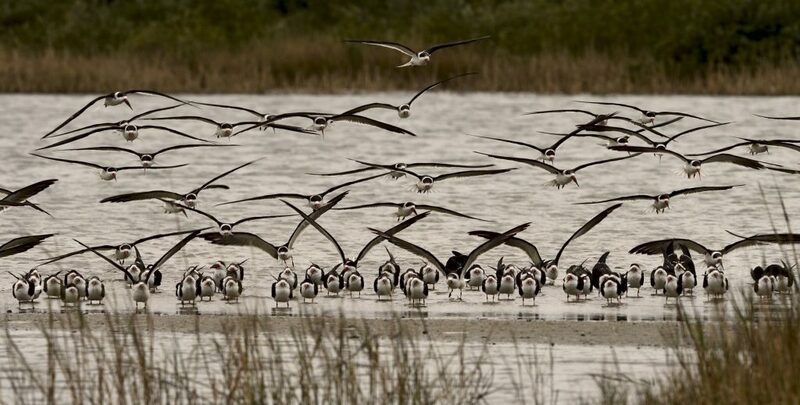 Don’t miss your opportunity to watch the real ‘early birds’ of Galveston Island as they awake, stretch, dance, stroll, vocalize and take flight in groups generally headed southeast towards the airport or southwest to large open pastures. Bring binoculars if you have them. Spotting scopes will be provided. Photographers are welcome but space is limited on the nature observation platform. Driving directions will be emailed prior to the event. Tickets: $40, 10% discount to GINTC members. Driving directions to the meeting site will be emailed prior to the event. Bring binoculars if you have them. Spotting scopes will be provided as needed. Explore the diverse habitats of the East End of Galveston Island and see the birds that make Galveston their home in the winter months. Sit back and enjoy the ride by van and easy walks as you tour the Seawall’s East End marshes, lagoons, beach, ship channel and salt flats. To enhance your birding experience at each site, participants will be riding in two separate vans that will travel the same route in opposite order. If registering as a group, make sure your birding companions are signed up for the same van. Popular field trip leaders Dr. Alice Anne O’Donell and Kristine Rivers will lead participants on this adventure designed for birders of all skill levels. Spanning almost 700 acres of diverse habitat, the East End Lagoon Nature Park & Preserve includes both tidal and nontidal wetlands, beach dunes, a freshwater pond, black mangroves, upland prairie, and an extensive marine coastline. During the winter these areas abound with Snowy, Piping and Black-bellied Plovers, the American Oystercatcher, American Avocet, Long-billed Curlew, Marbled Godwit, Caspian Tern, Belted Kingfisher, Reddish Egret, Roseate Spoonbill, Osprey, Northern Harrier and more. Ducks include the Black-bellied Whistling Duck, Mottled Duck, Northern Shoveler and Red-breasted Merganser. Savannah and Lincoln’s Sparrows are often sighted, too. In 2018 Greg Whittaker embarked on a yearlong survey of Moody Gardens 240 acre property with the intent to showcase the diversity of species that use the habitats or can be viewed from Moody Gardens throughout the year. The adjacent 170 acre golf course was added to the surveys in late January 2018 and the project was informally called the “410 acre year”. Through October, the combined 240 surveys yielded 210 species. 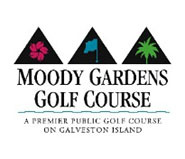 Join Greg at Moody Gardens Golf Course for an hour of “chasing birdies”. The group will drive carts to 4 of the more scenic and birdy habitats the course has to offer. From there, everyone will meet at Moody Gardens for a guided walking tour of the Moody Gardens complex. Potential sightings on the 170-acre Moody Gardens Golf Course include Osprey, Black-bellied Whistling Duck, Blue-winged and Green-winged Teal, American Wigeon, Mallard, Mottled Duck, Long-billed Curlew, Greater Yellowlegs, Loggerhead Shrike, Sandhill Crane, and a variety of herons and egrets. On the Moody Gardens grounds, potential sightings include Peregrine Falcon, Common Loon, Red-breasted Merganser, Sora, Greater Yellowlegs, Least and Western Sandpipers, Dunlin, and Neotropic and Double-crested Cormorants. Local birders love birding Galveston during the winter months! Traveling by van, we will show you all of the favorite West End hotspots including freshwater ponds, coastal marshes, bay waters and the beach. Our focus will be from Moody Gardens to 8 Mile Road. Although we’ll see some of the same birds seen on the East End trip, we’ll also see Sandhill Crane, a greater number of species of ducks and hawks, White-tailed Kite; and we’ll get closer looks at sandpipers, gulls, terns and American Oystercatcher. The areas we will visit also provide habitat for Piping, Snowy and Black-bellied Plovers, American Avocet, godwit, and curlew. Popular field trip leader Dr. Alice Anne O’Donell and Kristine Rivers will lead participants on this adventure designed for birders of all skill levels. The Galveston Island Nature Tourism Council would like to thank our partners and sponsors for their generous support of Holiday with the Cranes. If you are interested in becoming a sponsor, please click here for sponsorship opportunities.